Mariana was great guide. Prompt. Knowledgeable about the local details. Mariana was so knowledgeable about the area and took us places we would never have gone on a ship tour. She was so considerate of our interests and limitations. Mariana was very friendly, easy to talk to and knew so much about Punta Del Este. The fact that she's a teacher showed with the way she explained things to my kids. We had a lovely tour not only of Punta del Este but also other quieter and more local towns which gave us a better picture of Uruguay. We were lucky to have her as our tour guide. I would highly recommend her to anyone who wants to get a real taste of Uruguay. TOUR GUIDE RESPONSE: Hi Bob. Thanks for your words again! I am so grateful... If you are still in Punta in these days you are invited to my daughter 3 years old party at home next Sunday at 16pm. Anything you need just write me. It was very nice to meet you both. Warm regards, Mariana. Mariana was wonderful. It was a somewhat unusual request we had. We wanted a local to pick us up at the Montevidea Airport and bring us to Punta del Este. When we departed the terminal this morning she was there as promised and during our ride to Punta del Este she more than met our desire for information about the region. She was delightful. knowledgeable and engaging. I give her 5 stars. Mariana helped us through a day that was very stormy. We were ready to drop our plans for the day but she and Shalko made quick adjustments to their plans and then convinced us to go ahead with our tour and we were very grateful that we did. Despite occasional weather interruptions we got a wonderful tour of Punta del Este and a bonus drive along the coast, as our ship was unable to dock in Punta del Este. TOUR GUIDE RESPONSE: Thanks for sharing your experience and giving your feedback. I value your positive attitude towards the situation and how you kept the good memories! I am glad you took the decision of going ahead with the Tour beyond the hard weather conditions. I enjoyed as well! Thanks and be always welcome to my town. Mariana is a very knowledgeable and enthusiastic person who understands the history and culture of her city. Mariana's attention began before reaching Punta del Este until after we left. Not only did she show us her city and the history of it, but she also showed us what it is like to live there. At the end of the tour, she took us to a meat restaurant that was spectacular! And with that we closed our visit with a flourish. Thank you Mariana for all your attention and affection to make us feel from the first moment, as if we had received a friend from many years ago. TOUR GUIDE RESPONSE: Oh Marie! You cant't imagine how happy I am for reading this words. You were such a perfect group! The tour flows so great with people like you all. Thanks again and feel always welcome to my town which is now your home too. It was a good expérience To discover Punta del Este. Mariana was very professional. I recommand her . She was very helpful. TOUR GUIDE RESPONSE: Thanks Evelyne. I am glad you enjoyed as well. Kind regards. Mariana and I had emailed back and forth to set up a custom tour for our short stay in Uruguay. She did a perfect job of fulfilling all our wishes. A delightful person with a vast knowledge of her country, the 6 of us couldn't have been happier with the time we spent with her! TOUR GUIDE RESPONSE: We spend such a WONDERFULL time! Thank you for being part of this experience. Hope you keep spreading your beautiful energy. See you soon! My whole family loved this tour, very informative and interesting. TOUR GUIDE RESPONSE: Dear David, It was such a pleasure to share this experience! This feedback definitely feeds my soul and encourages me to keep doing this activity which is much more than just guiding, is helping you to understand and value this little piece of uruguaian coastal territory. Deep thanks! TOUR GUIDE RESPONSE: Dear Michele, Thanks for your comment and such nice words. I´m glad you enjoyed the Punta shore experience. Be always welcome to Punta del Este! We recently arranged for three consecutive day-tours of Punta del Este through Tours by Locals, and we enjoyed them so much we asked for an additional fourth tour on our final day, before returning to Canada. Mariana and her driver are a wonderful team, and their spoken English is very good. Mariana is gracious, professional, and very knowledgeable. I'd highly recommend her to anyone looking for a tour of Punta del Este. TOUR GUIDE RESPONSE: Thanks for your words Warren. Although the weather did not helped that much we did enjoyed the trip as well. Hope to see you again and be always welcome to Punta del Este! TOUR GUIDE RESPONSE: Dear Ken. Thanks for your comment! It gets easy to make a good tour when I have such a great group of travellers. We had an amazing time. Be always welcome to Punta! A wonderful day with people who really understood the area. Highly recommend if you will only be in port for the day. Do yourself a big favor and get a driver...no matter what. Having someone so knowledgeable was terrific! Mariana was a very outstanding tour guide during my visit in Punta del Este. She & her spouse (the driver) picked me up @ the hotel I stayed @ on time. The information Mariana brought up about Punta, i.e. its history (how Punta was formed, the wars that were fought, its former name, etc. ), what makes it a jet-set destination among international visitors, local cuisines, investing in Punta, etc. I must say she is very resourceful & hospitable. Make sure when you visit Punta, let Mariana be your tour guide. She is an extremely friendly person and she truly catered to my wishes. She is very knowledgable and very helpfull. Her husband was our driver and and a also very friendly and helpfull. We had a delightful tour with Mariana. She was very professional and her English was good! 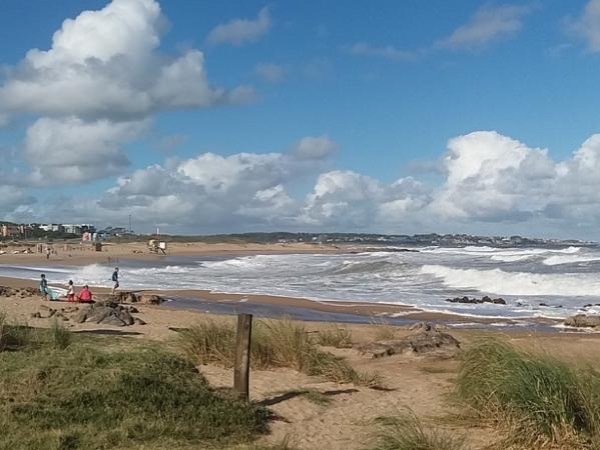 There isn't a lot to see in the area, but Mariana gave us a good insight to the people and customs of Punta del Este. We walked at a comfortable pace and Mariane answered questions as we went. TOUR GUIDE RESPONSE: Sandy, I appreciate your comment. I am grateful that you could understand as much as possible of Punta daily life and glad you enjoyed our walk! Kind regards. Mariana. Mariana was a real breath of fresh air for our group. We had a challenging itinerary that needed guidance so we could accomplish all of our desired venue visits, and Mariana struck just the right balance between moving us along and allowing us time to absorb the places we visited. She even provided us true local experiences by a visit to her own neighborhood and taking us through some local areas which tourists don't usually get to visit. It was an outstanding visit for everyone in our group. TOUR GUIDE RESPONSE: Sondra, thanks for your words, I specially value your opinion because you have travelled around the world. I enjoyed sharing the journey with you and your party and I am glad this experience satisfied your expectations. All were very kind with me. Really loved the artistic video you created with the pictures! Very friendly and knowledgeable. Willing to be flexible and help us plan for future activities. Experienced in areas of geography and history.